Although we never got to see this matchup officially in the WCW, thanks to some bloated egos and a general mismanagement of talent, Chris Jericho has gone on record multiple times saying that this one did happen backstage. And while we're absolutely positive Jericho exaggerated the story to some extent, the nuts and bolts of it remain pretty concrete. In the glory days of WCW, Goldberg was "the man" and Jericho was just a guy desperately trying to get screen time on a show overrun with out-of-shape former superstars. And Goldberg let his feelings known that he had no intentions of working with such a low-level talent in any major capacity. When word got back to Jericho, he immediately confronted the fire-snorter about it. 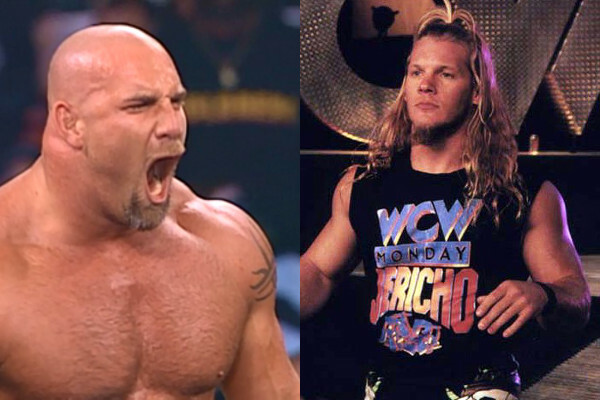 Things reportedly escalated into a full-blown fight once Goldberg put his hands on Jericho's throat. According to Chris: "I'm not the toughest guy in town, but where I come from, if you put your hand on somebody's throat...you gotta f*cking do something about it." Then the two scuffled a bit before Jericho allegedly locked him in front face lock, where he held on for dear life so the big guy couldn't get up and, in Chris' words, "kill me." The two were eventually pulled apart by the likes of Hurricane Helmsley and Booker T. Jericho considers himself lucky that they got pulled apart when they did. "There will never be a rematch, ever. If it ever happens, Ill run away screaming because Im not going to say I got lucky, but Im glad the outcome was the way it was because I thought he was going to tear my head off." Unfortunately, Goldberg has never told his side of the story, leaving us to believe that either 1) it really did go down this way or 2) he's too nice of a guy to get involved in this kind of smack-talking. History says it could be a little bit of both.